So here is the last part of decorating your Easter egg diorama's and the most fun by far. Part 1 here and part 2 here. You can decorate any way you want there are no rules! 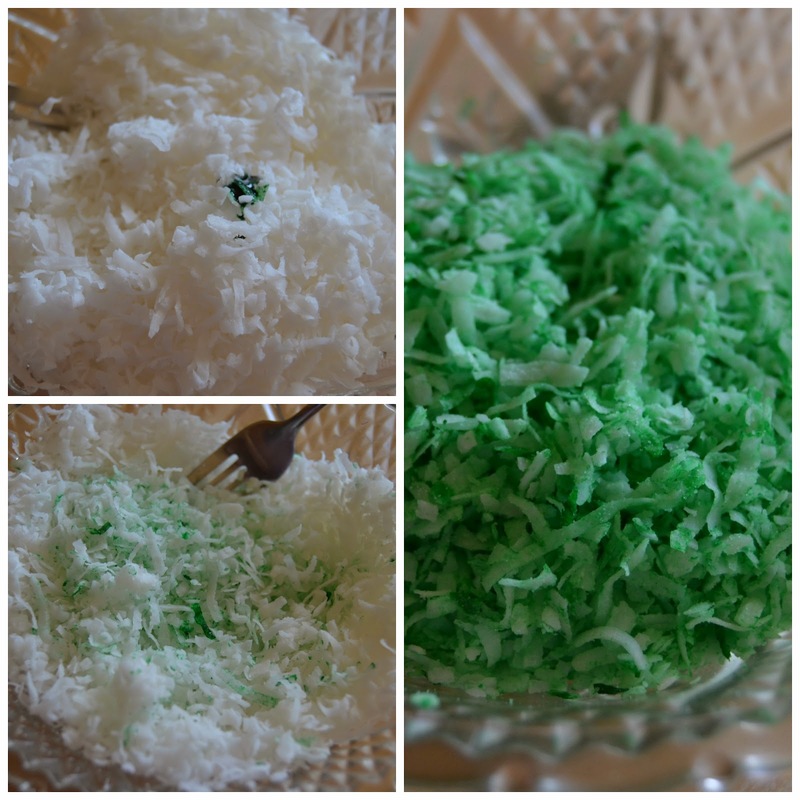 First if you want to add grass just take some coconut and add some food color drops and mix. I added ten drops to a cup of coconut. As I mixed it the coconut fell out of the bowl all over the place lol... Maybe you could mix it in a zip lock baggie to keep the mess small but make sure to add color drops two at a time until desired color. Part 2- Now that your egg has dried for 24 hours its time to prepare the under or inside of the egg. I start by placing the egg back into its form and then start digging out the still partially wet sugar. The crust will be hard so gently scrape until you break through to the wet sugar that comes out easily. The reason I place it back in the form is to support the egg under the pressure I will be putting on it so it will not break. I just use a spoon to scrape the inside out. As you can see my center hole goes all the way through now. keep scraping and taking out sugar until you achieve the shape you want. Just keep in mind that if you make it too thin it might break. I keep mine kind of thick because I have broken many before. It takes time to make these and you do not want to spend two or three days making one only to have it break on you.